Using custom video games & iPads to stand out at a veterinarian conference. Pharmaceutical company Boehringer Ingelheim had a problem. 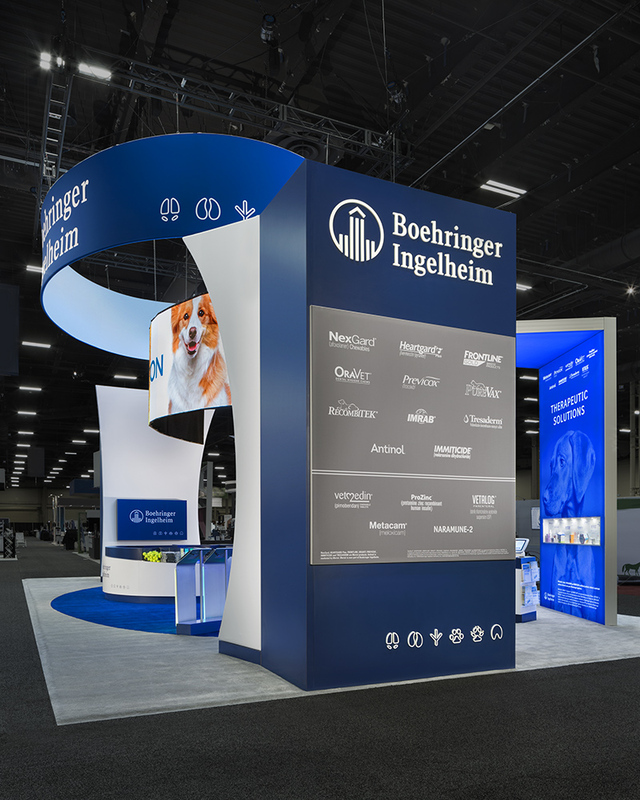 They had recently rebranded their Animal Health division just in time for the annual AVMA conference. But… they didn’t have a rebranded booth ready that would show off the fresh look of the division and attract new clients. In case you’re not in the veterinary industry, the AVMA conference is basically the South by Southwest of animal healthcare. Connections & relationships built at this conference generate much of the annual revenue for vet-based companies. Because of this, it’s important for companies to attract the right prospects and have a hit booth. The more interaction at a booth, the more deals get made and the more revenue generated to keep a company growing. 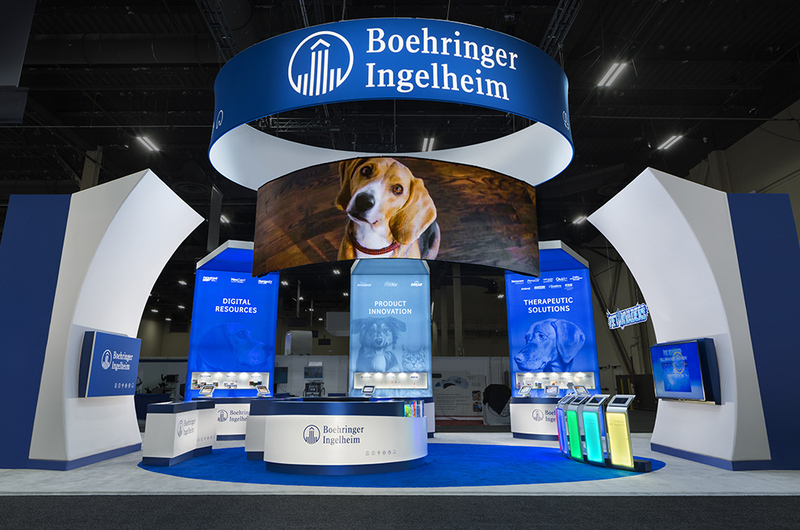 In order to take advantage of that, BI wanted to create an exhibit that not only showed off their rebrand, but also attracted conference participants. This would allow them to forge new business relationships in the animal healthcare industry. Blue Sky Exhibits worked with BI to create a modern 20x40 island exhibit, an interactive gaming display, and 12’ product-showcase towers. Additionally, a 30x30 VIP lounge area was constructed to cater towards current clients of the pharmaceutical company. These 4 exhibit pieces served to attract prospects to the BI booth, get them interested in the products, show appreciation for & strengthen the relationships with existing BI clients. After the Discover Session, BI and Blue Sky decided on 3 goals for the conference. The exhibit needed to stand out on a crowded showfloor, and attract prospects and veterinarian leaders. The exhibit needed to educate prospects and clearly demonstrate how BI’s solutions could help them. The exhibit needed to show off the refreshed look and brand. This would symbolize a commitment to continued care and progress in the animal healthcare industry. With these 4 goals in mind, Blue Sky got to work. The first step was coming up with a way to attract prospects to the booth. To do this, Blue Sky designed a 6-man gaming station where conference participants could play ‘Pet Invaders’. This was a custom-coded, interactive game BI had created where players can shoot various ‘pet invaders’ like rabies, fleas, and ticks. The highest score even got a prize. The booth game not only gave conference-goers a break from the crowded exhibit floor, but also got them interested in BI’s products by playing a nostalgic, fun video game. The gaming station, coupled with a t-shirt giveaway and tickets to a BI-sponsored concert, attracted tons of people to the booth. But getting people TO the booth was half the battle. Now BI needed to demonstrate why their products were ideal for solving their customer’s problems. 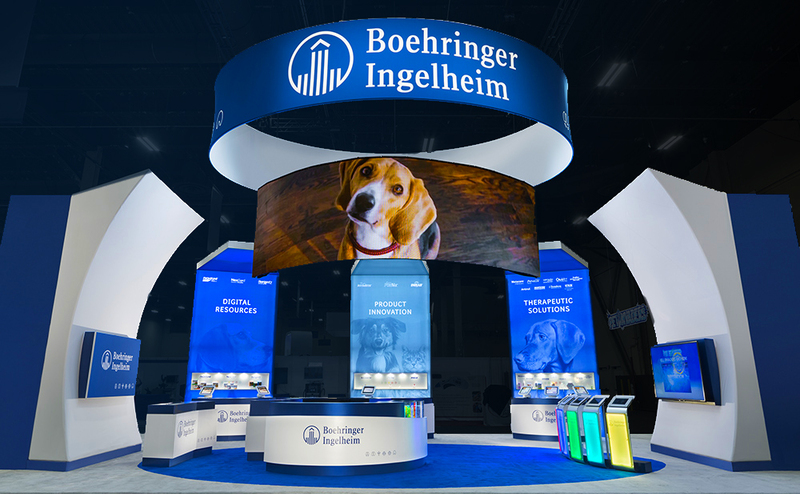 Blue Sky accomplished this by constructing three 12’ towers with large, backlit fabric graphics, each one showcasing one of BI’s product lines. These lofty skyscrapers quickly directed a prospect’s attention to one of BI’s 3 product lines. This was great because prospects didn’t have to look around to find what was right for them- they just had to look to the towers for instant feedback. At the base of each tower were sampling stations. Each station had interactive iPads to display product information and benefits. The base stations also featured display cases and areas to collect peoples’ contact information to follow-up with them. Finally, in order to take care of current BI clients, Blue Sky created a 30x30 VIP lounge. This invitation-only area was stocked with comfy couches, large TV screen, free food and drinks, and a special takeaway for clinics and clients already supporting BI brands. Tell readers about the results here. Did BI have higher-than-normal booth numbers? Did they get any kudos on the booth design? Do you have any testimonials from clients or prospects about what BI did for them at the conference? Was it a highly-attended exhibit that increased BI’s revenue and gave them an ROI for the conference?